For astrophotographers, we often struggle with maintaining focus while changing filters, the seeing condition changing during the session, expansion and contraction of the OTA during an image capture, and so forth. It’s enough to make one pull their hair out at times! On top of that, rotation of the camera to grab the entire image within the CCD chip’s field of view can be another hassle that requires the imager to be at the scope, whether in a fixed observatory or not. This can make life difficult for those of us who want to use a truly remote observatory and site. 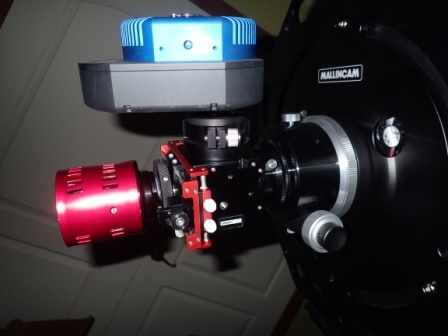 I have been using telescopes for film and limited CCD use for well over 20 years, and because of extensive business travel coupled with a spouse who cannot access the observatory due to disability, I needed a product that would be solid, reliable, allow for remote precise FOV rotation, temperature compensation, no requirement to find a zero-point and reinitialize the position of the drive motors, and easily adaptable to various optical tubes. As an engineer and former aircraft mechanic, I demand a great deal out of the build quality of anything that I own as well. This review will be focused (no pun intended) on the build quality, software setup, system compatibility, and out of the box operation and impressions. 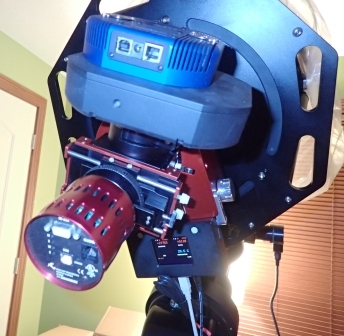 For the purposes of context, the mount is a Losmandy Titan 50, with a Mallincam 12” carbon truss RC optical tube assembly. Because I didn’t have any use for the stock focuser, I have been waiting for this focuser to arrive. The stock focuser was basically useless when having to carry approximately nine pounds of gear on it; too much slip and flexure of the optical train to be useful. The original configuration is shown below. The optical train carried by this focuser consists of a Foresight Innovations ONAG-XT on-axis guider, QSI683WS CCD imaging camera with eight-position filter wheel, and a Fishcamp guider on the rear. Personal testimony: I have known Ron Newman, the owner of MoonLite Telescope Accessories, since around 2010 when I needed a focuser for a 5” Meade refractor OTA, and while I had bought a focuser used online, Ron was very helpful with my needs and questions, and since then I have owned five of his focusers as a result of the customer service experience. He offers many other items as well and all are quality items made in his shop. I once sent an OTA to him that had a non-standard thread on the tube, and he fabricated a custom mounting flange in two days and had me up and running. All items sold by him are fabricated in his shop in Pennsylvania. 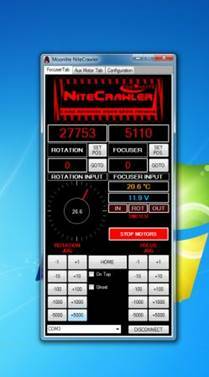 When I contacted him about a focuser with a rotator for the RCT and the remote observatory, he told me to take a look at the new NiteCrawler, which I did. Since Ron was developing and building it, I felt that it would be solid and dependable. The focuser arrived in its box well-packed with all contents wrapped in heavy layers of bubble-wrap and tape, all nested within the usual green Styrofoam peanuts. Upon removal of the bubble wrap around the focuser, the first impression is, “Whoa.” The second impression is, “This is a beast!” The build quality of the focuser is immediately apparent. I shook it around for rattle and there was only silence. I pushed around on the focuser barrel and rotator and it didn’t move – not even a few thousandths of an inch as far as I could tell. The driven barrel inside the body is as solid as you could wish for. Please see the initial images. Note the support rails and bearings supporting the drawtube. Smooth operation and very robust. Bearings ride against the stainless-steel support rails and not the drawtube, which is a marked improvement over many aftermarket focuser mechanical designs. 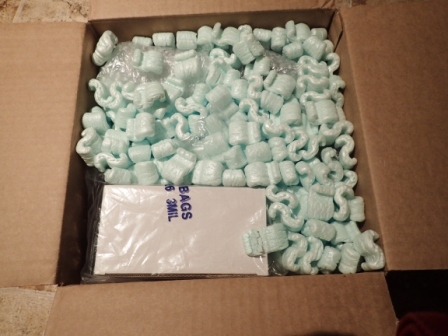 The white spots are just Styrofoam bead packing remnants. Note the fine engraved rotator graduated markings. The drawtube is also slightly baffled and matte-finished to eliminate stray light reflections. Note that the barrel is internally threaded for the installation of focal reducers using a reducer carrier module that can be seen on the MoonLite website. The purpose of this carrier is to eliminate all slop and flex from every aspect of the imaging train and maintain the correct position of the reducer at all times. Note also that there is a swing away display module that also controls the step of the worm drive focuser and rotator as controlled through the “focuser” knobs on the side for manual use. 1X, 10X, 50X, 100X, 200X, and 500X steps are available, a step being .001 degree of the worm rotation.. Finally, this focuser is heavy. Medium to large refractor owners might be able to get rid of that ugly counterweight on the rear of the OTA. Moving on to the build review, I used the 2” 3-way compression fitting and threaded it into the body of the focuser. Wow, this is a solid fit. I removed the stock focuser from the 12” OTA and threaded the NiteCrawler body onto the OTA flange. It went together very smoothly and tightened snugly without any snags or slop in the threads. See below. I then attached the optical train to the NiteCrawler and did a fit test. I also flexed the optical train, knowing that the ONAG XT guider assembly is extremely rigid. I could detect no motion or flex in the focusing barrel clamped into the massive support bearings supporting the focusing drawtube. A downside is that there is almost no finger clearance to tighten the 2” adapter compression bands with the drawtube fully retracted. It’s best to tighten these when the focuser is extended a little bit. Before moving on, note that the NiteCrawler emphasizes the use of worm gear drives and absolute encoders to not only control the rotator and drawtube with extreme accuracy, but to always remember its position even if the power is lost. This was very important to me in remote, robotic imaging use. After downloading and installing the USB and ASCOM drivers required, as well as the NiteCrawler stand-alone software, it was time to power up and test it. All in all, though, I was able to tie in the focuser into my ASCOM suite quickly. Once setup, I will report performance back here using FocusMax. MoonLite has also included a stand-alone control set that provides extremely robust and precise operation of the system without a planetarium program required. Initially, I could not get the non-ASCOM driver to work. However, it was because ASCOM 6.2’s focuser platform was running at the same time in the background. Ron advised me on this and I’ve since loaded and operated it in non-ASCOM mode without any issues. Stand-alone page in operation shown below. There is also a SkyX Pro module that will be available soon in the daily build to drop the NiteCrawler into the planetarium software and run it in all aspects available. I could operate just the focuser in ASCOM via SkyX Pro. However, I would need the new module for full integration into SkyX Pro and have all functions available. Looking at the swing-down readout, you can see this info on the focuser as well. Note that in my setup and using an ONAG, it places the imaging camera in an unusual position and while playing with the rotator, I crashed the camera into the display module while homing the focuser. My own stupid fault, as I had not set up any rotator limits. However, the focuser did not move from the readout position and the rotator pushed on through, rotating my QSI body in the process. 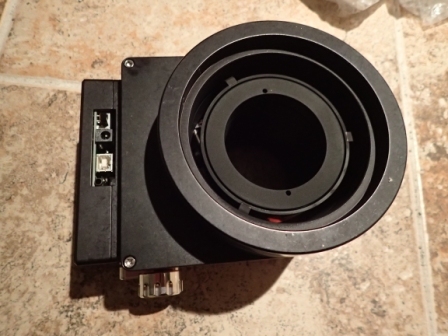 In the future, I will get a 2” extension tube or two from MoonLite and install it prior to the ONAG body – this is probably needed anyway to correctly place the focal plane for the QSI imager. This unit operates exceptionally smoothly and it is almost silent. No “rabid badger” noises… I had to stare at it intently to see if it was even moving because the control is so fine! Has a lot of potential, especially with the focuser that will be designed for off-axis guiding on the third axis sometime in the near future. Being from MoonLite, the support will be there when you need it. 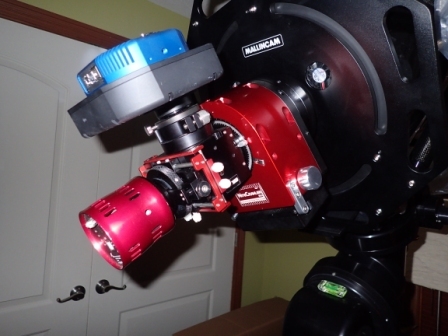 Usable for almost all scopes – the ones that may present some difficulty are small 70mm refractors and the like. Heavy. Your rig needs to be solid. It is expensive, but for my application it is well worth the money. Solid, if expensive, product that will help you achieve your imaging goals be removing some critical imaging hassles. I have included the MoonLite products page from the web with permission because I might misstate a feature or specification. Thanks for this review. Considering they are both about the same price and load capacity, I wonder how this compares to the FLI Atlas. From appearances it looks like the NightCrawler has more travel and the ability to manual focus, while the Atlas uses up less back focus and is lighter. I have an Atlas and a MoonLite CXL and love both. I'm sure the NightCrawler is a real prize of a focuser. Thanks for the positive words, Craig! Regarding the focuser, I've seen the Atlas but have no experience with it. 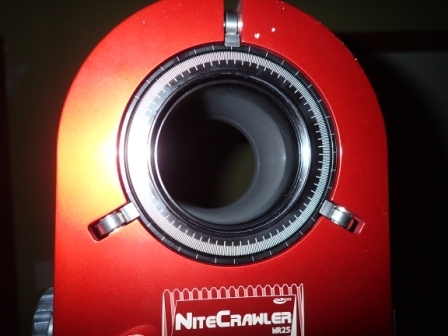 However, the NiteCrawler is approx 23mm shorter than the factory focuser on the 12" RCT with the factory rack and pinion installed and drawtube retracted, so back focus might not be as big of an issue as one would think. It's heavy, and it's very precise, and the square area of the front profile is about 7.26 X 8.10" with the display folded under. However, from the side it is very narrow in comparison with many other focusers. In fact, it is shorter with the drawtube retracted than the 2.5" refractor focuser from MoonLite that is on my SV102ED... and that third axis output for autofucusing the OAG in the future is a really nice touch. If you are coming near the Dayton/Columbus/Cincinnati triangle and would like to apply your Mk 1 eyeball to it, I'd be happy to show it to you. BTW, just so it's clear to anyone reading this, I have no affiliation to Ron Newman or MoonLite. I've established my relationship with Ron through the years by doing business with him, as I have with Scott Losmandy and others. I paid out of pocket for the focuser because I needed it for a remote setup and I wrote the review because, for the build level and tech that this unit has and what Ron has created in his shop, I thought it was an outstanding piece of craftsmanship and thought others should know about it. I've had some rather offensive things said in my direction on reviews before and wanted to ensure the record is clear. Nice review! 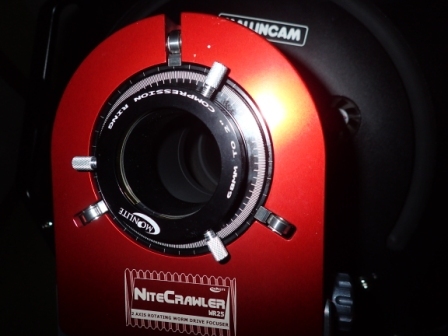 I have a Nightcrawler I am currently using with a Tak 5" refractor. Love it! I have a question for you as well as a tip. Question is I am currently using ASCOM with FocusMax. It works but I am looking to test TSX @focus2 and wondering if you're using that and if you are, does it work with ASCOM or do you have to use the TSX driver? Second is a tip for when you get extenders for your optical train. Ron machines these things so when they are screwed in they are definitely screwed in! I had a heck of a time switching out the extenders and found that strap wrenches are an absolute necessity! I told Ron about this and he is going to treat the threads somehow so they are easier to get off. My Moonlite experience is very similar to yours. I go back to around 2005 with them when I got my first motorized focuser for my newtonian. Customer service there is second to none! Currently my system is in my downstairs office and we've not been able to start the observatory construction. So my only very basic, limited use has been presented here. I'd suggest to ask Ron. Thanks for the review. 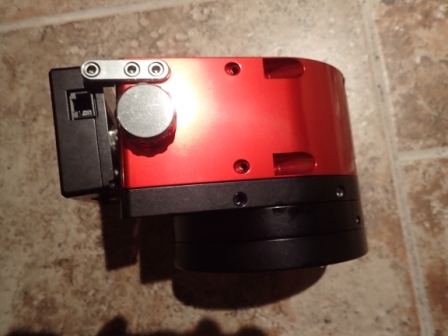 I have been waiting about 3 months to order this for my 10 inch f/4 imaging Newtonian. I wanted a quality focuser with rotator and I thought the other solutions had to much outboard hardware. Thanks for the great review! I just purchased one recently from Tolga and it's supposed to arrive here on Monday. I'm not sure I should be this excited about a focuser, but I am. My NightCrawler WR30 shipped today. It took them about 8 days to machine an anodize a flange for my 12 inch diameter tube. Between the GSSP and OSP I plan to have it imaging under dark skies for a bunch of nights this summer. It will stay on my backyard observatory setup for the rest of the time. I got mine last night. I need to increase the focuser opening on my carbon fiber tube from 3 inches to 4.5 inches. The flange for the 12 inch diameter tube is very nice and it spreads the focuser weight out over a much larger surface area than the original focuser. 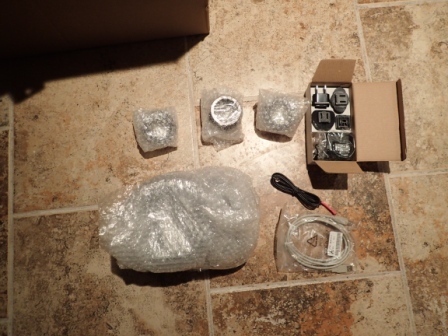 I ordered an Aurora Precision AZ-10 cell to replace my simple 3 point cell at the end of the tube. I will move the mirror forward to give me a little more infocus on the higher profile NightCrawler. I plan to order an f/4 10 inch Zambuto that will eventually replace my stock mirror. The 6 point AZ-10 cell will allow for a thinner mirror. The focuser is very nice but pretty massive. I notice the extra weight when I pick up the tube but it will be permanently mounted in my backyard observatory. I hope to put the NightCrawler to use soon after my AZ-10 cell comes early next week. Great review - inspires confidence. 1) When I pushed around on the barrel, I DID notice some movement. I'm not overly concerned because it seems to be under tension and springs back into position - not sure how much my payload will impact this. 2) I think the cutout on the control panel where the connections come out should have a better seal. There is a lot of gap that could allow dust, dew, rain, bugs and anything else that can fit to get inside the control panel through those gaps. 3) When I first got it the both the ASCOM driver and native (SKYX) driver were working fine. All of a sudden, my ASCOM driver no longer works on the ROTATOR (focuser ASCOM is fine). The ASCOM driver for the rotator does not report a Position Angle (PA) - instead it simply reads "nan" (not a number) in SKYX and SGP for that matter so I am stuck at the moment using only the SKY driver. I spoke to Ron (Moonlite) and he said he is willing to do whatever it takes to get the ASCOM working again, including replacing the control panel if necessary, so I can rest fine knowing that if/when I need to get this done, I just need to make that move. All-in-all, I must say that I LOVE my Moonlite WR-35 and expect it to serve me well for many years to come.